Floral motifs have been a staple for Gucci over the years. The Gucci Museum will be showcasing the designer’s most iconic motif in an exhibition titled The Language of Flowers, curated by Martin Bethenod, the director of Venice’s Palazzo Grassi-Punta della Dogana. This tribute to flora will feature several iconic artists and their floral masterpieces. This exhibition will display the works of four artists, who are, aesthetically worlds apart, but thematically united by a common floral subject. The masterpieces were created between 1967 and 2012. As cliche or overdone as flowers may initially seem, each artist executes a profound commentary, simply using the flowers as a background, or context for their message. Their relationship with botany is more than a pretty bouquet; further, they draw inspiration from topics of vanity, personal memory, political controversy and the value of art. French photographer, Valérie Belin, fuses vintage-style photographic portraiture with floral overlays. This superimposition blur the lines between human and nature. The floral motifs elegantly complement the subjects, adding a degree of personification to the flowers. Flowers take on faces, gazes and elegance, while the women whom embody them, fade effortlessly into the background. Moroccan artist Latifa Echakhch, channels a life experience-turned-metaphor through the Fantôme (Jasmine) sculpture. Jasmine flowers are delicately draped over a stand, sheltered by a simple white shirt. This piece narrates resistance to the chaos of life, and demonstrates natures graceful persistence to remain unaffected by that chaos. The sculpture was inspired by a personal memory of a traveling Lebanese jasmine merchant covering his floral necklaces with a shirt to protect their scent and freshness. Also featured in the exhibit are Irving Penn’s Cottage Tulip, Sorbet, New York and Single Oriental Poppy photographs. A monochromatic photograph is paired with its color version to ultimately represent the desire for perfection and an awareness of the vanity of everything surrounding us. 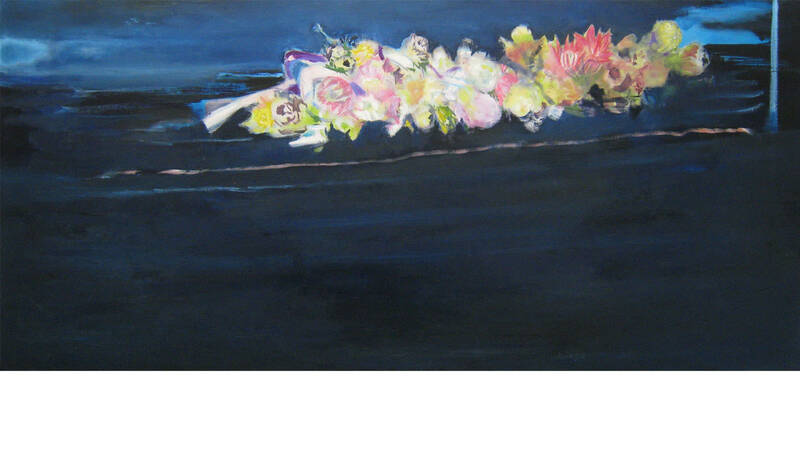 Inder by Marlene Dumas bares a somber secret: These flowers that float brightly upon a sea of gloomy blues were a nostalgic tribute of the ones placed upon the coffin of the artist’s mother, who died shortly before. The subtle and persistent beauty these flowers lend to the overall somber mood of the painting represent a beautiful commentary on grief.